Eye "Muerto Concert" by Rennie Rau Marquez and other Dia-themed works and altars through November 4. No matter what the time of year, the folk-arty The Folk Tree is our must-browse stop when we find ourselves on Fair Oaks in fair Pasadena. We practically throw ourselves at the huge display of silver jewelry and whimsical wood carvings, and then we compose ourselves and politely chat up the nice people who work there. But come October, we head directly to The Folk Tree for one thing and one thing only: Day of the Dead altars. Muertos run amuck, joyfully, outlandishly, wickedly, on these exquisite works on display at the rear of the shop. 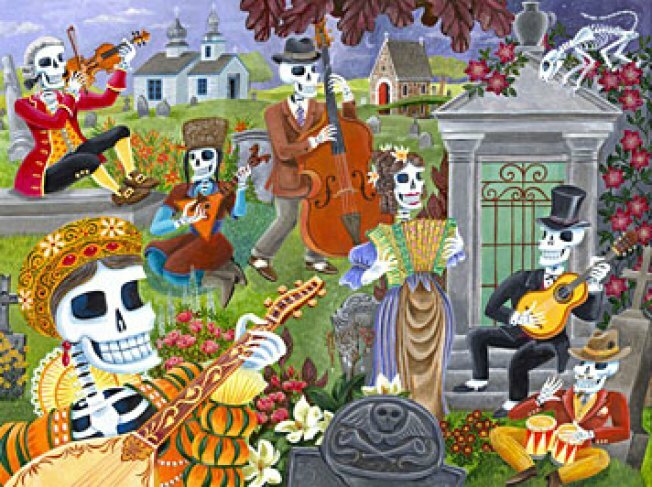 Here, a skeleton strums guitar, there, a bony couple, smiling broadly, exchange nuptial vows. Even if you will not be making your own sugar skulls or planning a feast for a loved one long departed as so many people around the city will be, a half hour among these lovely altars puts one in touch with the beautiful, witty and meaningful spirit of Dia de los Muertos. You might even leave with a tiny skeleton dentist or flowery skull of your own. We're looking for a little skeleton who sits at a computer all day, with glasses and painted toenails. Maybe this year we'll get lucky?